Applying for a Japan Visa (specifically 1-B Tourist Visa with no guarantor) isn't difficult, as long as you secure all the necessary documents. All Japan tourist visa applications must go through accredited tour agencies. See the list of accredited agencies here. I applied through Reli Tours & Travel Agency in SM Megamall while my friends applied through Discovery Tour Inc in Makati. This at least 2 blank pages and should be in good condition (no damage on the lamination, pages, etc). You may fill out this form and print this out once accomplished. Put NA on blanks not applicable to you. 2" x 2" (4.5cm x 4.5cm), white background. Paste this on your Visa Application Form. I got a copy of my birth certificate from SM Business Services for Php 160. It takes 5-7 business days before you can claim it. Not applicable to me, but required for married applicants. 6. Daily Schedule in Japan. You may download the form here. Also known as TAIZAI YOTEIHYO. 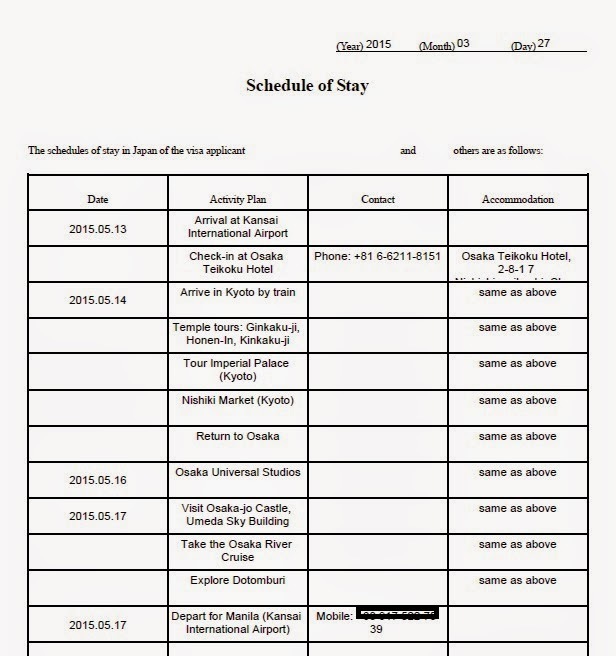 It's a detailed itinerary of the activities you plan on doing in Japan. Make sure the dates indicated in your Daily Schedule is as same as the dates in your Visa Application Form. I requested a Bank Certificate from BPI for Php 100 (debited from my account). My bank certificate was printed as I wait, but I'm not sure about the process time in other banks. I requested for a copy from my company's HR Department for this. However, Reli just got the photocopy and returned the original copy to me. It wasn't in the list of requirements but Reli accepted it when I presented my COE to them. I paid Reli Php 1200 for the visa processing while my friends paid Discovery Tour Php 800. 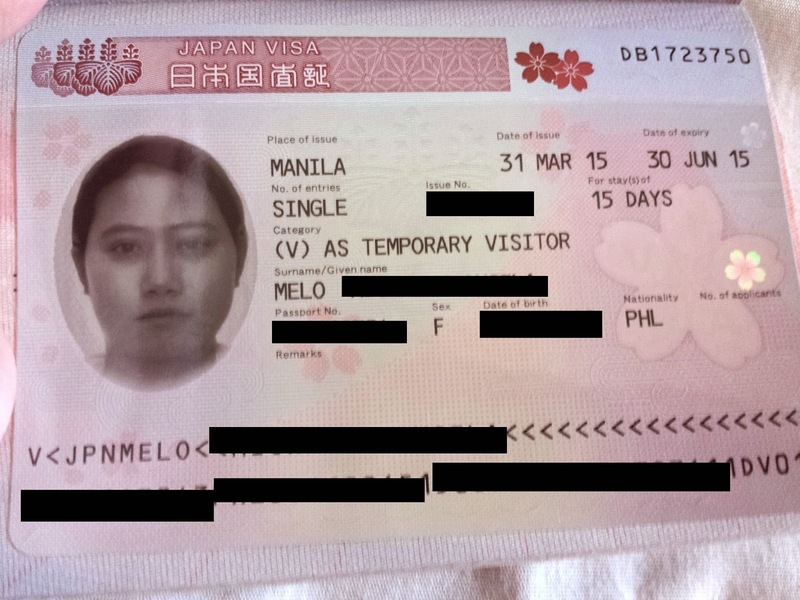 The expected processing time is 7 to 10 business days but I got my Japan visa approved in 4 business days. I got approved for a single-entry tourist visa, which is valid for 3 months from the date of issue. I spent a total of Php 1520 for all the documents (excluding the passport). I will use this as reference because I am definitely going to get a Japan visa someday! Hanggang visa pa lang ako! :P Ikaw yung nag-Japan. hahaha!